Soooooo, guys, I have a problem. The new job has lunch catered every day. And it comes in the form of more food! 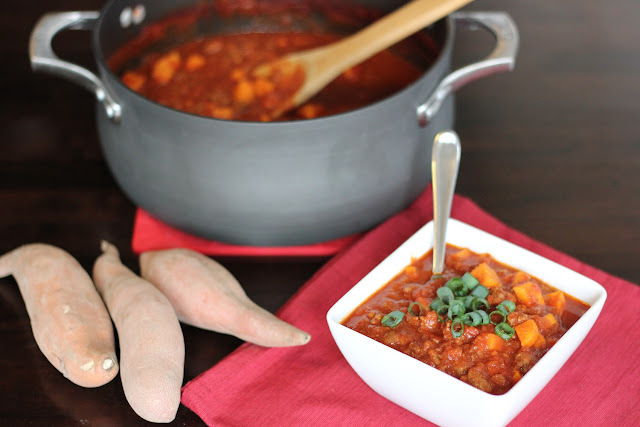 I needed something that would give me enough satisfaction that I would be able to turn down FREE food catered from restaurants, and paleo chili is just the thing to come to the rescue! 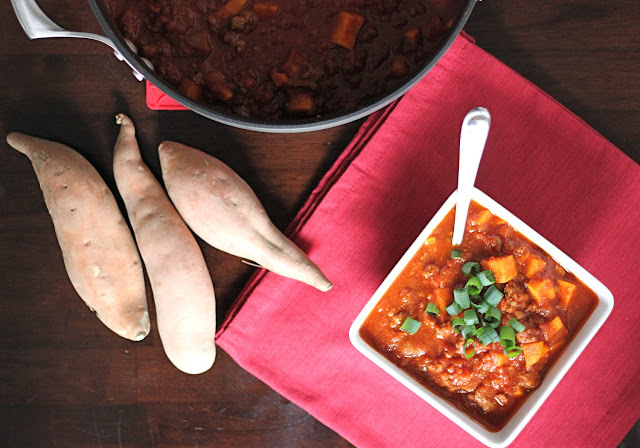 This paleo chili is so, so, so, so good. I mean, it's good. Are you picking up what I'm putting down? Lot's of meat and sweet potatoes and a slightly tangy sauce. Plus you can whip it up in about 45 minutes! If that's not a life saver I don't know what is. Seriously. Try it for yourself! Paleo chili is the way to go. You won't even miss the beans. Who really wants beans in their chili anyways? P.S. You'll probably want to make a double batch - just double the ingredients below. The extras freeze great! *Side note - don't be afraid of 85/15 GRASS-FED beef. The fat in it is healthy fat since it is coming from animals that ate nutritious and natural grass as their diet. Chop onions and bell pepper. Place a large pot or Dutch oven over medium heat. I've found that I can brown my meat and sauté the onions and bell pepper at the same time. If the meat has enough fat in it there is no need to add any extra oil for sautéing the onions and peppers. Throw your meat, onions, and bell pepper into the pot on the stove. Using a spatula or wooden spoon break up the meat as it browns into small pieces. Once the meat is browned and the onions are soft, drain fat if needed. I usually push the meat and vegetables to one side and use a paper towel to soak up some of the fat. But I leave some for flavor! Next, add your crushed tomatoes, tomato paste, beef stock, and all spices except hot sauce and lime juice. Stir well. Add your peeled and diced sweet potatoes. Bring to a boil and then reduce to simmer. 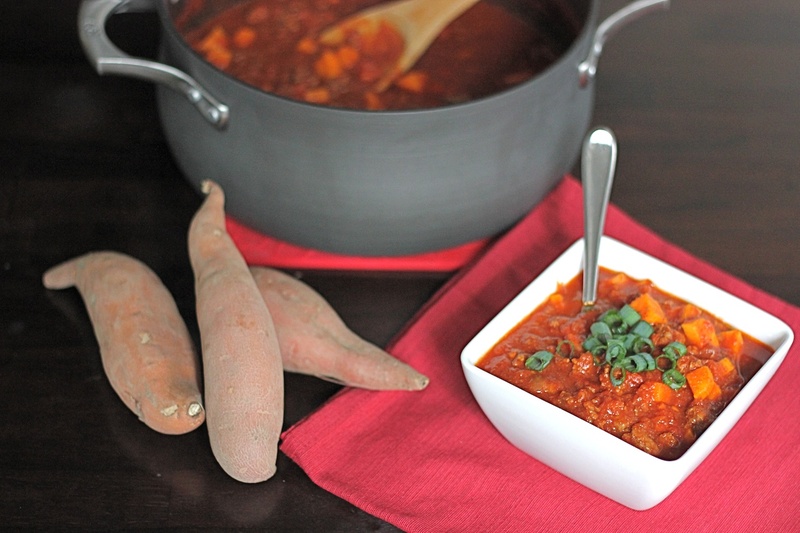 Simmer for 30 minutes or until sweet potatoes are fork tender. Add hot sauce and lime juice. Taste. Adjust seasonings as needed. Enjoy a healthy and satisfying lunch... dinner... or even breakfast (just throw an egg on top!). This looks and sounds amazing! I am putting this on the menu for next week! This looks absolutely delicious! I am loving sweet potatoes like never before. Free catered food? That would cause quite a problem for me too! Hard to resist. Holy cow is it yum! Just sat down with a bowl. Thank you! What a nice comment! I'm so happy you enjoyed it! I wish i could taste a bit of it!! Could this be made in my crockpot instead? I bet it can, but do you recommend any recipe alterations to accommodate switch? I think it could, I've thought about doing it in the crock pot myself, but since the cooking time is so short I usually end up just making it on the stove. The one thing I worry about is the sweet potatoes getting mushy and falling apart in the crock pot. Please let me know how it turns out if you make it in the crock pot, I'm sure it will be delicious! I'm fairly new into the Paleo world and this is by far the best recipe that I have come across. It's absolutely amazing and I'm going to make the 2nd batch of the week a little later today. What a nice compliment! Thank you! Any idea what the calorie count is per 1 c? I made this tonight and it was awesome! Great way to have a warm, filling, paleo meal on a cold night. Thanks for sharing!